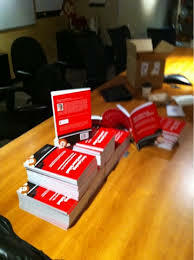 Get Catering and Grow Sales Books going out the door. It’s been almost four years since I wrote my book, Get Catering and Grow Sales: A strategic perspective for the multi-unit restaurant executive. I remember how much I disliked it after I wrote it! I thought to myself that I could have done so much better. If not for one of my team members at MonkeyMedia Software who grabbed the manuscript and hired an editor to help finish it, I never would have published it. It’s amazing how we are always hardest on ourselves. Our own worst critic! To my good fortune, turns out that the book is pretty popular with the restaurant community. 10,000 copies in print and distributed is not a bad run. As we begin 2015, I am reflecting on what it is that I need to focus on this year. So much is going on, and business is brisk both at MonkeyMedia Software, the Catering Institute and our new media division, Catering Insights. These divisions are all focused on catering and off-premise sales in our foodservice community. There is so much for all of us to learn in this part of the restaurant business. I am committed to try and provide more leadership in this area as best I can. Since writing the book, I have continued to develop an organizational framework that I call the 5 Pillars of Successful Restaurant CateringTM. This framework is meant to provide a working model for restaurant brands to use as a compass while considering their takeout, delivery and catering business strategies. I have come to learn that without these pillars, there is little hope for our community to succeed in this business channel. And so, 2015 is the year that I will renew my commitment to the restaurant community to further develop the concepts of the 5 Pillars of Successful Restaurant CateringTM. I plan on writing more and making videos to help educate our community on these concepts.